Home » »Unlabelled » WHAT DOES YOUR TONGUE SAY ABOUT YOUR STATE OF HEALTH? WHAT DOES YOUR TONGUE SAY ABOUT YOUR STATE OF HEALTH? If you are feeling under the weather, just stick out your tongue – the state it’s in can present an accurate picture of your health. The colour, texture and moisture of your tongue can provide signs of what’s going on inside your body. Many complementary therapies, including Acupuncture and Naturopathy, use the tongue to aid diagnosis. 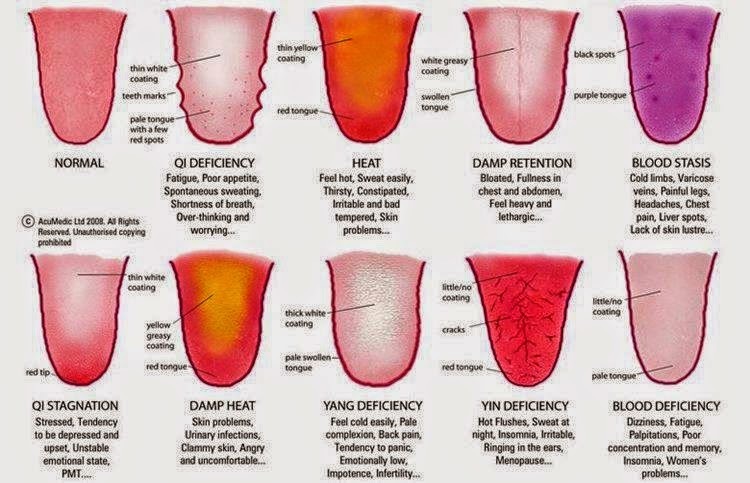 When examining the tongue, the Acupuncturist looks at the colour of the tongue body, its’ size and shape, the colour and thickness of its’ coating or fur, locations of abnormalities and moistness or dryness of the tongue body and fur. These signs reveal not only overall states of health but correlate to specific organ functions and disharmonies, especially in the digestive system. Not all tongue irregularities are indications of disharmony however. Food and drugs may change the coating or colour of the body of the tongue; for example, coffee yellows the coating. Furthermore, some people have minor, unchanging cracks on their tongue which are considered normal. Others are born with what is called a “geographic tongue,” which is covered with severe cracks and covered with hills and valleys. This is considered normal by some practitioners but a sign of disharmony by others. The way a tongue appears is not an absolute indicator of the location of the disharmony but when taken as part of an overall pattern that includes a complete evaluation, they offer strong clues to the location of disharmony. Tongue diagnosis can be a subtle art. To try it yourself, observe the variations of your tongue and compare it to that of friends or family members. After you have looked at a few tongues, you will see that they differ widely and with a little study can tell you a lot about the overall health of a person. Surface changes: Run your fingertip across the surface of your tongue, and you should feel lots of tiny nodules that feel slightly hairy or fuzzy. These nodules are calledpapillae, and they’re actually small hairs between which your taste buds are scattered. Changes to these hairs may have no rhyme or reason and be totally harmless, or they may be a symptom of an underlying condition. Smooth: Your tongue may feel smooth due to a nutritional deficiency. A pale, smooth tongue could be a sign of iron-deficiency anemia or a lack of B vitamins, which are important to the body’s use of food for energy. Sores or bumps: We’ve all bitten our tongue at one time or another, perhaps hard enough to leave a sore spot. In some instances, a spot on the tongue can be a result of something more than surface trauma. Canker sores more often pop up on the underside of the tongue, and can be identified by a round, red border and yellow or white center. A white or gray lesion with a hard surface that feels thick and raised from the tongue could beleukoplakia, a disorder of the mucous membranes caused by irritation from dentures, crowns, fillings, or tobacco use. Hairy leukoplakia, which occurs in people with weakened immune systems due to illnesses like HIV or the Epstein-Barr virus, appears as a fuzzy, white lesion that usually crops up on the side of the tongue. Colour changes: You’ve probably noticed how your tongue can change colour depending on what you eat (remember all of the rainbow colours you could achieve as a kid sucking on popsicles?). Variance from the usual healthy pink may be a sign that you’re overdoing it with certain habits – or it could signal an underlying condition. Black: From time to time, a person’s tongue may take on a black, hairy appearance. “Black hairy tongue” is a harmless, temporary, but unsightly overgrowth of tongue “hair” (papillae) that traps bacteria and other mouth debris. Poor oral hygiene could be the culprit, as could mouth-breathing, excessive use of tobacco, mouthwashes, some antibiotics, or bismuth-based stomach medications (e.g., Pepto-Bismol). Along with the colour change, you might notice a metallic taste in your mouth and generally bad breath. Brush, floss, and try using a tongue scraper to remove bacteria. Black hairy tongue resolves on its own, but check with a doctor if symptoms last beyond 10 days or so. White: White tongue often means the same thing as black or yellow tongue – bacteria stuck in dense tongue hair. And it shares some of the same causes, too: smoking, dehydration, dry mouth due to mouth-breathing. The white look means there are bacteria, dead cells, and debris wedged in the papillae. Pay special attention to your brushing and flossing habits, and add a tongue scraper to your oral hygiene routine. Less commonly, a pale, smooth tongue indicates anemia, and a white film on the tongue could be a sign of oral thrush, a type yeast infection. Red: A red tongue more often signals underlying problems in children’s health. A strawberry or raspberry-coloured tongue can be one of the first symptoms of scarlet fever or Kawasaki disease. Adults less often manifest these signs. But if your mouth hurts and your tongue looks smooth and red, your diet may be deficient in niacin, an important B vitamin. I suffer from chronic back pain (from a car accident almost four years ago). I have tried every possible alternative to conventional medicine, and nothing has given me as long lasting effects as acupuncture Mississauga. Now my pain is almost disappeared.